I love a good vampire novel, but I have to admit that in recent years I have mostly read YA vampire novels. 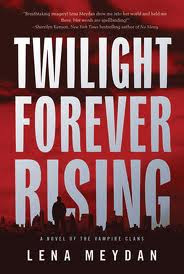 I was excited to hear about Twilight Forever Rising by Lena Meydan because it was getting great reviews from booksellers and was said to be a stand-out vampire novel. I guess in all honesty I need little convincing, so I dove right in. The vampire world in Twilight Forever Rising is a little bit complex and takes some getting used to as there are several clans of vampires (which also includes werewolves), each gifted in different areas, and they do have some system of justice and government. These vampires are practitioners of magic so it's a little bit like Harry Potter vampires. :) And the main character of the book, the only one to ever get this perspective told in first person, Darel Dahanavar, is a telepath or empath. He reads people and knows what they are feeling and thinking. This particular gifting makes him uniquely valuable to his house, but also enables him to retain some of his humanity. Darel does indeed fall in love with an 18 year old girl. She finds out he's a vampire fairly early on and has no issues with it, continuing the absurd sort of vampire love story we all adore. But the love story isn't the main focus of the book though it's crucial to the story, really there's a war brewing. The vampire clans aren't necessarily thrilled to be in peace and some are more power hungry than others leading to all sorts of action, violence, and suspense. I really enjoyed this book, I'm a complete sucker for vampire tales what can I say? I do think that key elements of story were introduced that will be brought to fruition in later installments. For example, the prologue is never resolved throughout the entire novel! Darel sets a plan in motion for revenge he thinks is brilliant but this plot line also seems to get dropped when events take a certain turn. So as a reader this made me frustrated because who knows when we'll get the rest of the books in English! But the vampire mythology was rich and interesting. I liked Darel, loved Chris his necromancer friend, and am greatly curious to spend more time with the other houses. The books is told at times through Darel's first person perspective and at times through the third person point of view of other characters. It's hugely ambitious with so many vampire clans all up in each other's business, but it can still be followed quite easily. Please note this book is translated from Russian.